Virtual Reality is a new set of technologies that has the ability to accomplish educational, business, and recreational feats never seen before. If you would have told somebody 50 years ago that they could climb and explore Mount Everest from the safety and comfort of their living room, they would not have believed it. As Mark Zuckerberg once said, “Virtual reality was once the dream of science fiction, but the internet was also once a dream, and so were computers and smartphones. The future is coming and we have a chance to build it together.” In OPIM Innovate, I recently had the opportunity to explore this past dream of science fiction with a Latino and Latin American Studies class: LLAS3998 – Human Rights on the US/Mexican Border: Narratives of Immigration. The Lab was coordinated by Anne Gebelein, a UConn professor who wanted to expose her class to narratives in public policy including the United States border, immigration, and other Latin American topics. Gebelein had realized that the usage of a new educational medium like Virtual Reality could allow her class a broader and much more meaningful experience while learning these challenging topics. In working with the Innovate team, I was able to construct a curriculum containing learning materials for a specially designed VR workshop: Creating Empathy for Human Rights. We made use of the HTC Vive virtual reality system as well as a set of Google Cardboards to facilitate this event. One of the experiences showcased was a virtual reality environment created by USA Today known as The Wall. 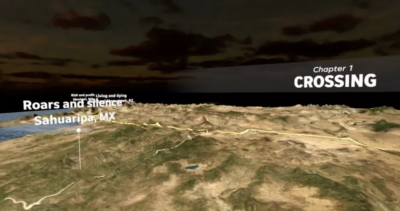 This Vive-only application allowed students to explore various parts of the USA-Mexico border wall as it currently exists today. The vast size and land area covered by the border certainly surprised many students. In further exploring the topic of human rights, students also investigated a solitary confinement VR experience that placed them in the shoes of an immigration detainee. Several students commented on the gravity and sheer discomfort they felt when they entered this environment. Overall, VR has certainly begun to prove itself a viable technology for a new style of practical teaching and learning. Throughout the course of this workshop, the LLAS class and Professor Gebelein were exposed to environments that they never could have entered through traditional teaching methods. I was very pleased that this workshop became a resounding success and we hope to further develop our materials and assist with more activities like this in the future. One of the most used features of the OPIM Innovate lab is the Fused Deposition Modeling (FDM) 3D printer. 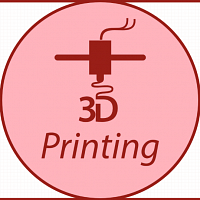 We are always interested in new innovations in 3D printing and what students like to use the 3D printers for. We were lucky to have a chance to show a big name company upcoming technologies we had in the space. Stanley Black & Decker’s executive personnel came to UConn for a networking event with the OPIM department. I had been tasked with 3D printing a momento to give to the Stanley team. As a manufacturer of tools and hardware, I thought it would be appropriate to print some kind of tool for them to take back with them. Doing some research I had discovered a functional wrench model that we could print as one piece. Once I printed them I found that they were not always functional. I modified the wrench features and diameters to get what you see below using Tinkercad and Makerbot Desktop. Over the course of several weeks I experimented with several wrench sizes and materials. Our main criteria to improve the design was to reduce print time and while ensuring they were still functional. 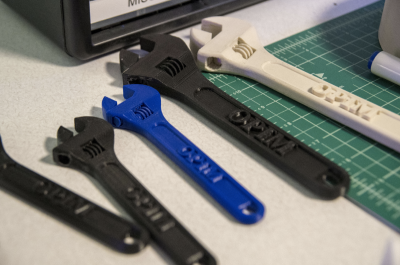 I found that wrenches that were made of ABS and approximately the size of the blue wrench seen below was the best design.When I decided to reprint, I decided to brand them in order to make them more personal. In the end the Stanley team was intrigued by what we were doing with the space and the 3D printing technologies I had shown. It was a good professional experience to speak with them and present what I had learned during my academic career. It is no understatement to say that the invention of the smartphone has completely altered the way that we look at business and communication. After 10 years with this device, it is hard to imagine a world without it. However, this is not the first major technology that has changed our world forever. In the last 100 years we saw the invention of the radio, the television, the personal computer, and the internet. With the rate of adoption of new technology continuously increasing, it is safe to say that the next disruption may be right around the corner. That is why in Professor David Noble’s MGMT 4900 class he emphasized the importance of emerging technology in business strategy. Virtual Reality or VR is the simulation of a digital environment that the user is able to interact with through sight, sound, and motion. The concept of VR can be traced back all the way to 1939 with the release of the View Master. In the 1980s new consumer and industrial technologies began to develop that looked similar to modern VR headsets, but they were either far too expensive or poorly designed. Thanks to advances in computing technology, VR saw a resurgence in the last decade that made it more worthwhile for businesses to invest in. It is one thing to just talk about this technology in a business context, but it is another thing to get hands on experience. Emerging technology like virtual reality can often be financially unobtainable for the average college student. Having a lab right in the business school dedicated to hands on exposure to emerging tech is something special that not many schools have. For our class we decided to focus on two types of virtual reality technology; Google Cardboard and HTC Vive. The Google Cardboard is an entry level VR headset that is powered by smart phone. The headset itself can be purchased from various retailers or self-built. We focused our discussion around how the New York Times is reinventing how it tells stories through the use of VR. We also explored applications like Google Cardboard Camera that lets the user create their own VR experiences. This is the style of VR that most people will be able to have access to. We then explored the HTC Vive which is a more immersive VR experience that includes motion controls. This headset is significantly more expensive and needs a powerful computer to run most applications. However, the quality of VR experience is much better than the basic Google Cardboard. We focused our discussion around education tools like BodyVR that takes you on a journey through the human body, and Everest that lets you experience an expedition from the base camp to the summit. The HTC Vive allows for a more interactive and detailed experience and is what we imagine the future state of VR will look like. Both the HTC Vive and Google Cardboard are changing the way we imagine digital content and experiences. Although many see VR as just a toy for gaming it is so much more than that. Every year the price of headsets decreases allowing more developers to create new experiences. Companies from every sector are looking at how virtual reality can be used to improve employee training, operational efficiency, and the customer experience. As more content is created, more users will adopt this technology, and ultimately change the way we consume digital content going forward. The UConn Mind Body Health Group will partner with the OPIM lab to use virtual reality and other related technology as potential interventions for various psychological and physical health disorders. A presentation will be scheduled for this academic year open to those interested in mind body health research and applications of innovative technology. The OPIM lab is partnering with Johanna deLeyer-Tiarks, a School Psychology doctoral student under the advisement of Dr. Melissa Bray on her dissertation research. This study will investigate the usefulness of Virtual Reality technology as a delivery model for Self-Modeling, a practice rooted in Bandura’s theory of observational learning. It is theorized that VR technology will facilitate an immersive Self-Modeling experience which may promote stronger gains than traditional Self-Modeling approaches. A research project is being developed to investigate this theory through the applications of Virtual Reality Self-Modeling to individuals who stutter. The research will culminate in a VR intervention to treat clinical levels of chronic stuttering. This project is in its early stages of development. IRB materials are not yet approved. On April 26th, OPIM Innovate will hold a 3D Modeling workshop for UConn faculty, staff, and students interested in learning about the use of Solid Works for 3D Modeling. During the workshop, attendees will be given an overview of 3D Modeling technologies and how they are used in different industries. Real world demonstrations of 3D Printing will also be shown, and additional resources will be provided for those who would like to learn more.